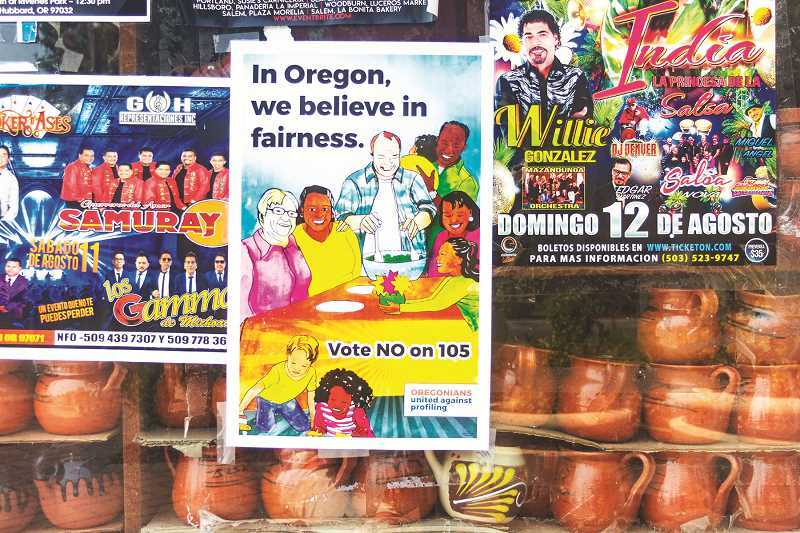 Posters that read, "In Oregon, we believe in fairness. Vote NO on 105," are the first part of an opposition campaign challenging Oregon Measure 105, a ballot initiative to repeal Oregon's sanctuary state law. Measure 105 was filed April 25, 2017 by three Republican members of the Oregon House of Representatives: Sal Esquivel, Mike Nearman and Greg Barreto. Oregonians For Immigration Reform (OFIR) led the campaign to gather signatures for the measure, which successfully qualified for the November ballot on July 17 with 110,445 signatures. Oregon's sanctuary law, which was established in 1987, prohibits local law enforcement from "detecting or apprehending persons whose only violation of the law is that they are persons of foreign citizenship present in the United States in violation of federal immigration law." OFIR maintains that repealing Oregon's sanctuary status is not a matter of racial profiling, a common accusation by opponents, but rather an environmentalist response to climate change. OFIR co-founder Jim Ludwick, a self-described climate change agnostic, said that OFIR believes that immigrants will increase consumption of natural resources and speed up carbon dioxide emissions. "We're a group of regular American citizens, in favor of traditional immigration policies," Ludwick said. Ludwick said the group wants the United States to allow only 230,000 immigrants to enter the country per year, and said he supports immigration quotas "based on a number of different factors." In addition to ending sanctuary laws, OFIR also supports a change to the 14th Amendment to prevent citizenship status being given to the children of people who are illegally in the United States, and deportation of all immigrants here illegally regardless of whether they have a criminal background. Ludwick said the organization opposes any asylum for immigrants. "I don't think we should give it out to anybody; it's not to our benefit," Ludwick said. Leading the opposition to Measure 105 is Oregonians United Against Profiling (OUAP,) a broad coalition of businesses, law enforcement professionals and civil rights organizations, including Woodburn's own Pineros y Campesinos Unidos del Noroeste (PCUN), the largest Latino labor union in Oregon. "Some of our members who are longtime residents of Woodburn recall seeing immigration agents aided by local police busting down doors and grabbing people off the street, with no way of knowing their immigration status," said Reyna Lopez, executive director of PCUN and PCUN's political action wing Accion Politica PCUNista, or APP. That fear re-emerged in February of 2017, when, during two separate instances, Immigration and Customs Enforcement (ICE) detained a Woodburn man while looking for his brother and arrested 11 farmworkers on their way to work. Latino residents feared the recent inauguration of President Donald Trump was resulting in a resumption of ICE activity due to what seemed to be an anti-immigrant rhetoric. Students at Woodburn High School even created a play in response to the incident, "Sin Miedo," which means "Without Fear," which expressed the anxiety and panic that spread in the community and especially among children afraid that their parents might be detained and deported. "Immigrants, including those who may be undocumented, shouldn't have to live in fear that doing basic things like going to work or school or reporting a crime to the police could result in harassment or their families being torn apart," Lopez said. Today Woodburn's Latino population, the majority of the town's demographic, has a strong relationship with the police department, Lopez said. Residents feel protected by police and unafraid to report crimes. Woodburn Police Chief Jim Ferraris said that WPD's relationship with federal immigration enforcement is clear under current law: They cooperate when there is a crime committed by a person here illegally that requires federal assistance or when presented with a warrant signed by a federal judge. "Our work in the local community is to provide public safety and law enforcement services to all members of the community, regardless of any political or religious affiliation, including immigration status," Ferraris said. Ferraris said that in the process of investigating a crime, police might contact federal immigration enforcement for information. However, if someone calls to report that a person is in the United States illegally, police will not investigate the report, and when they make an arrest they will not report that person's immigration status to ICE. "That's not our role; that's the work of the federal government," Ferraris said. He referenced a recent situation in which police were called to intervene when ICE agents demanded access to a local woman's home to search for a suspect. WPD mediated the conflict, spoke with the immigration officers and searched the house in their place. Ferraris said that afterward, he was thanked not only by the woman and the president of PCUN for his department's help, but also by the ICE assistant special agent, who complimented him on the professionalism of WPD's officers. "It doesn't get any better than that; it tells me there is a high degree of trust in the community," Ferraris said. Lopez said that the trust between the community and police could evaporate if Measure 105 passes and the immigrant community is once again uncertain what role local law enforcement will play. "We're concerned that if 105 passes, police could play the role of federal immigration agents," Lopez said. "Many immigrants will be afraid to report crimes, seek help if they have been victimized and provide information to police that can help solve cases." In 1987, then-Rep. Rocky Barilla (D-Salem) sponsored the Oregon sanctuary law, which passed in the Oregon Senate 29-1. Barilla created the bill in response to a lawsuit he had worked on as a lawyer a decade before. In 1977 Barilla represented Delmiro Trevino and three other men in a class action lawsuit against the Polk County Sheriff's Office. Trevino was one of four Latino men who were interrogated by Polk County sheriff's deputies at a Hi Ho Restaurant in Independence. A deputy grabbed Trevino and interrogated him in front of the restaurant's other customers. Trevino was a U.S. citizen, and approached Barilla to sue for harassment. Barilla's lawsuit eventually accused the federal agency then responsible for immigration enforcement, the Immigration and Naturalization Service, of instructing Oregon law enforcement to racially profile and harass Latinos. The lawsuit was later dismissed, but led to a change of policy prohibiting local law enforcement from performing immigration arrests without an INS officer present. "Getting rid of this law opens the door to serious civil rights violations and more racial profiling of Oregonians, simply because they are perceived to be undocumented immigrants," Lopez said.